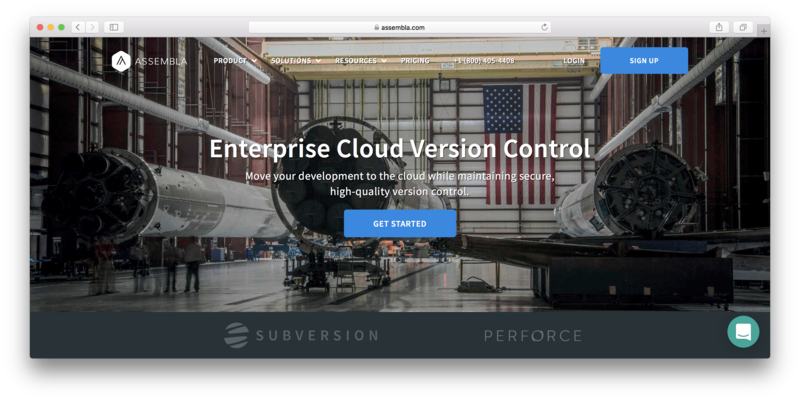 "Enterprise cloud version control for secure source code management in the cloud. " Assembla scored 85/100 in the Code Repository category. This is based on user satisfaction (78/100), press buzz (51/100), recent user trends (rising), and other relevant information on Assembla gathered from around the web. Assembla is a cloud-based project management software solution designed to facilitate team communication and application development. The software provides a digital workspace for teams to collaborate on projects and product development. The system was developed to facilitate the collaborative processes that small- to medium-sized businesses (SMEs)and large enterprises often tackle through a set of productivity tools and services they can easily access and use any time they want. As a secure digital workspace that combines all the necessary tools and services to make project management easier and more efficient, Assembla allows users, everyone who has a stake in the project, to confidently and securely collaborate with projects wherever they are and anytime they want. With its many great features and capabilities, teams can work together effectively, make collaborative decisions on the fly and be more productive especially when dealing with projects and assignments that have quite a tight deadline. The centralized interface, which allows everyone who has a stake on the project to always be in the loop when it comes to progress and the hiccups team members might face. Easy access to coding resources for project developers and IT teams. Clients and everyone else involved with the project has the ability to keep track and monitor the progress of assignments and the development of the entire project. Managers and team leaders have the ability to track billable hours and allocate resources for multiple projects. The service also enables users to set objectives and milestones, as well as track the progress of individual projects through various stages. In addition to these practical features, Assembla offers two key platforms to make sure teams have everything they need to effectively tackle projects. These Assembla platforms are Assembla Workplaces and Assembla Portfolios. Assembla Workplaces offers a combination of tools and services built around the team to keep the project development process more streamlined. Management ticketing, code repositories, collaboration and issue management—these are just a few of the tools and capabilities available with Assembla Workplaces. Assembla Portfolios, on the other hand, is the platform that allows users to take full control of multiple projects with a wide range of capabilities. The system comes with a centralized user management solution, reporting function and a branded portal. Assembla offers its users a robust but versatile platform that seamlessly integrates a wide range of tools and services to facilitate project management and collaborative processes, providing a cohesive digital workplace for mobile and widely distributed teams. Even if you’re a small business owner or a project lead/manager who doesn’t really buy into the big data trend, you’d be remiss not to appreciate the value of good reporting. Assembla offers a practical user-defined reporting platform that is not too far-removed from high-level dashboard most teams are used to. The system allows users to create custom reports based on their needs. The software solution also offers an impressive set of collaboration features and capabilities designed to sustain a consistent flow of information among the teams and its respective members. The platform works just like most social media channels everyone today is familiar with. When it comes to product development, software or otherwise, flexibility in terms of project management has become a crucial element. Assembla, as a project management software solution, is designed to keep up with the shifts in priorities and requirements businesses often face when tackling projects. Whether you’re engaged in a small business project or a large-scale enterprise, having a platform that enables you to efficiently manage project portfolios is definitely a welcome addition. Assembla allows managers and stakeholders to stay on top of all teams tackling similar projects through its Project Portfolio Management or PPM capabilities. Keeping track of potential issues during the development of a product or in the middle of an ongoing project can be difficult. And the time it takes for teams to address issues is very crucial. With Assembla, users can take advantage of issue tracking and management features that allow them to easily track and address potential issues in the quickest and most efficient way possible. Assembla offers an excellent, well-designed digital workspace for teams and project collaborators regardless of where they are or what time zone they’re in. It comes with great features and capabilities at a competitive price range. It’s definitely worth your while to at least check it out. Does Assembla integrate with any other apps? What platforms does Assembla support? Who are the main user groups of Assembla? Does Assembla offer guides, tutorials and or customer support? What is Assembla generally used for? Does Assembla offer an API?